Having flawless skin gives everybody a much needed confidence boost and no matter your age, skin tone or skin type, we can help you reach your skin care goals. 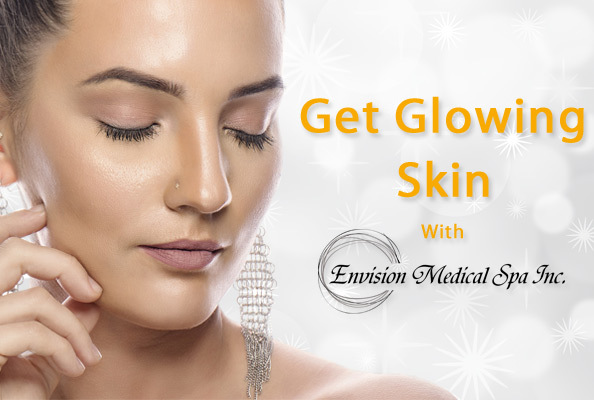 Makeup is often used to cover imperfections and actual serious skin issues but here at Envision Medical Spa we believe in fixing your skin rather than covering it up. Below are some of our favorite facial treatments that can help your skin glow! This dual action therapy is a popular treatment that uses a combination of Botox and Juvederm that softens harsh lines and fills out uneven areas on your face. Enjoy the benefit of an actual face-lift without the pain and cost that comes with! You skin is left with a smooth finish and your smile will be bigger than ever. Often you see Botox portrayed in movies and television shows in negative or comical ways - women and men having faces with little to no emotion and their skin not moving while they speak. When administered correctly, you will still have an expressive face with natural looking emotions. The benefits of Botox is not limited to just treating wrinkles, the FDA originally approved these injections to help those who suffer from migraines, headaches and excessive sweating. Feel like a new you with Botox injections from Envision Medical Spa! Replenish and rejuvenate your appearance with Juvederm! This filler uses hyaluronic acid to instantly restore lost volume in your face. This treatment can be used to help enhance your lips, cheeks, nasal line and jaw line for a natural-looking result that will give you constant compliments about your youthful skin. With eMatrix Sublative Rejuvenation you will achieve a more youthful look in just three treatments. This treatment effectively treats mild to moderate wrinkles, spots, and acne scars. During the treatment, energy is directed at the skin to form a martix of dots. New collagen and skin cells are produced; resulting in your skin becoming smoother and the appearance of wrinkles are significantly reduced. This treatment is a three-in-one solution for those dealing with an uneven skin tone, loose skin and wrinkles on your face and neck. Achieve total facial renewal with this non-invasive laser treatment that provides minimal discomfort and downtime with long lasting results. The majority of people who undergo this treatment notice a dramatic improvement in the overall appearance of their skin! Deep condition your skin with a Chemical Peel from Envision Medical Spa. This treatment removes the upper layers of your dry and damaged skin to allow new epidermal layers to flourish and regrow. The intensity of the peel depends on each person's unique circumstances.